Kev’s Decorating Solutions has been tiling for the last 10 years. I am based in the Bournemouth area and offer domestic and commercial tiling service throughout Bournemouth, Poole, Christchurch and surrounding areas. With many years of experience in the tiling industry you can be sure that I will provide you with both a professional and courteous service. I specialise in fixing all types of wall and floor tiles, and have a wealth of experience and guarantee to provide you with only the best quality workmanship. Kev’s Decorating Solutions can install any form of tile, and I offer a service to suit all budgets and will adapt to suit my customers’ needs. 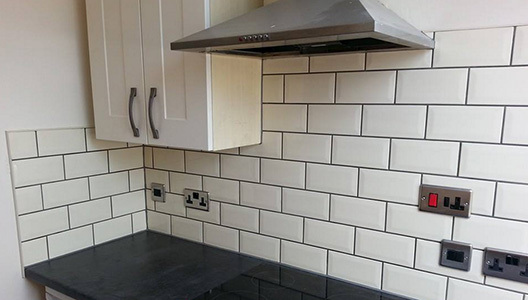 I undertake all aspects of tiling and pride myself on providing prompt, reliable service and a competitive price. Before and after shots of the bathroom floor around a storage cupboard. Nice!